« Valkyria Chronicles 2: Preorder Bonuses? In MY SRPG? Once upon a time, Squaresoft and Disney worked in the same building in Japan. Though they shared a residence, they each had their own projects and worked separately. 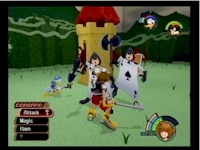 One day, Shinji Hashimoto had a chance encounter with a Disney executive in the elevator and an idea appeared: a collaborative crossover game featuring Disney and Squaresoft characters. Kingdom Hearts was released in 2002 for the PlayStation 2. It was an action RPG set in different worlds from Disney franchises — The Little Mermaid, Aladdin, Alice in Wonderland, Hercules — populated by characters from Disney cartoons and Squaresoft’s Final Fantasy series. It was a strange mix of moogles, Chip and Dale, Cid, Pluto, Yuffie, Mickey, and many more major and minor characters from both companies. Poker night in Wonderland could make you lose more than just your shirt. 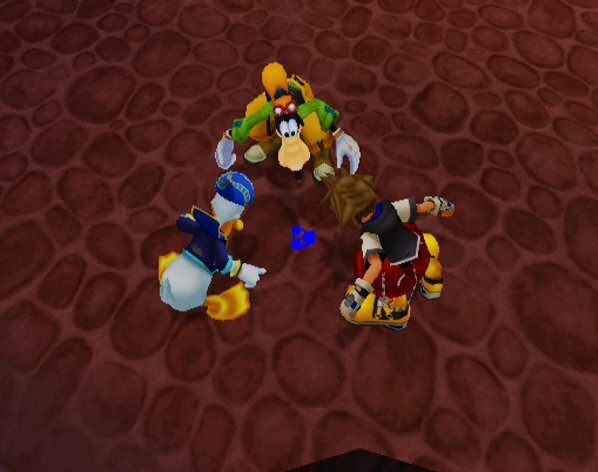 So how does Kingdom Hearts fit into gaming history? It’s not too unusual to see cameos in RPGs. Cecil Harvey from Final Fantasy IV and some of the cast of Final Fantasy VI made appearances in Secret of Evermore, for example. Super Mario RPG — another Squaresoft venture, though not an actual crossover — had cameos too. But Kingdom Hearts wasn’t just about cameos. It was a true crossover RPG. 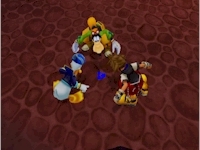 Sora, Donald, and Goofy discover a Trinity point. Crossover RPGs are not too common, but they tend to use characters from the same series. Tales of the World games use Tales series characters, for example. Crossover RPGs that use different game series, even games from different companies, are a new breed. Kingdom Hearts was the first blockbuster crossover RPG covering different franchises from two different companies. Since then, more of this breed have appeared, such as Namco X Capcom, Chaos Wars, and Cross Edge. Thus, Kingdom Hearts has its place among other game changers for proving that you can mix completely different franchises together and have the elements all live happily ever after.